With the fabulous tube technique described in this book, you can make fun and striking quilts in no time! Sew the strips together into sets, sew the sets together into tubes, then cut out triangles that open to squares. It's that easy! And best of all, the technique is perfect for strips! 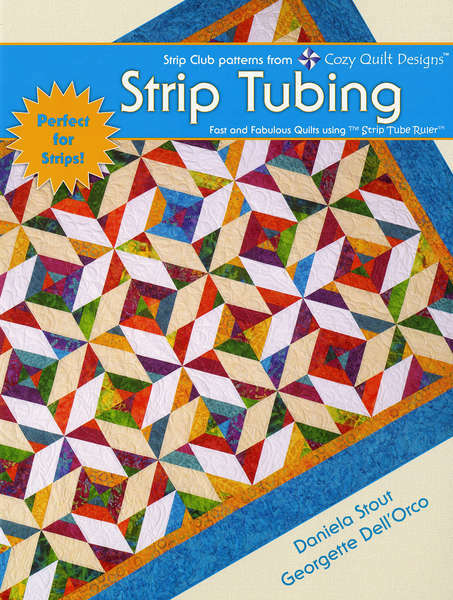 Strip Tubing is another in the line of top-selling books by Cozy Quilt Designs and it makes diagonally pieced Half Square Triangles a snap! Includes 5 full patterns - some with multiple layout options - all in multiple sizes. Features detailed instructions on the tube technique. Shows you how to make Half Square Triangles with the same technique! Offers alternate directions to use a square-up ruler. With great patterns and detailed instructions on this fabulous technique, Strip Tubing is a terrific addition to your quilting library.